With intelligent thrills and strong character drama built around an overwrought theme of nuclear paranoia, "Midnight Eagle" is reminiscent of the spy thrillers of the 1980s. Replace the countries involved with America and the Soviet Union, and plug a "Narrow Margin"-era Gene Hackman into the starring role, and you'd have one hell of a retro action flick. But for all its similarities of tone, "Midnight Eagle" reveals modern day fears for its country of origin, Japan. Here, the United States is both an ally and a danger - they are called upon to help, yes, but it's also their weapons and broken promises that caused the problem in the first place. Questions abound over the security of a nation with a limited military in an age of terrorism; while it's hinted that the villains are North Korean (mention is made of "the peninsula"), its perhaps telling that the bad guys go nameless and, more to the point, spend the middle of the movie as virtually indistinguishable from the Japanese Self-Defense Forces. Read that last point as you will. Screenwriters Yasuo Hasegawa and Kenzaburo Iida (adapting the novel by Tetsuo Takashima) and director Izuru Narushima appear intentional in their vagueness. Does the middle section, in which two journalists are caught in crossfire between two faceless platoons, suggest all war as horrifically impersonal? Do the villains' visual similarities to the heroes describe a modern world of terrorism, where danger could come from anywhere, and where threats are no longer easily defined by border and uniform? And what of the finale, in which the photographer, previously disgusted by warfare, decides the only way out is to employ the same weapons he once denounced? To discuss more of that ending would be to step into major spoiler territory, but it can be argued without spoilers that such a decision is not a contradiction of messages. Even here, the film remains brutally anti-war, yet it uses this apparent inconsistency for an admission that the world is not black-and-white, but full of grays, and it's in the moral haze of the middle where choices must be made. Perhaps the finest example of a moral conundrum can be viewed in the character of the Japanese Prime Minister (Tatsuya Fuji). Late in the film, he is burdened with heavy decisions of the how-many-must-die-so-others-may-live variety. He makes his decision, but the real point comes after, when he is instantly haunted by the choice. 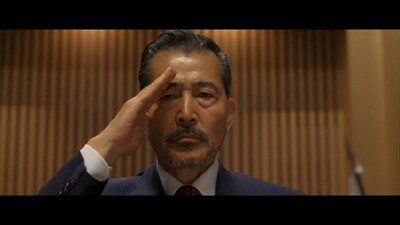 Thanks to a brilliant turn by Fuji, restrained yet boiling under the surface, the film's best moments come in the Prime Minister's slow internal collapse. The movie understands the choice he had to make but also refuses to portray such a choice as heroic, and the dramatic complexity of the no-win situation elevate the film. And yet not all is weighty morality play. "Midnight Eagle" is also a slick, whip-smart thriller, full of mystery and intrigue, action and suspense. War photographer Yuji Nishizaki (Takao Ozawa) has returned from the Middle East (more vagueness - no mention of Iraq, Afghanistan, or other such nation) with a disgust not just for warfare but, it would seem, for humanity in general. Abandoning his family, he's fled to the Japanese Alps, where he snaps pictures of the night sky and generally enjoys the solitude. One night, he photographs the crash of a top secret stealth fighter, and while he wants nothing to do with the matter, he's eventually convinced to accompany old pal/fellow journalist Shinichiro Ochiai (Hiroshi Tamaki) deep into the mountains in hopes of a scoop. That's where they find themselves in the crosshairs, stuck between an elite Japanese squad and a mysterious band of villains, both eager to find the bomber - and the nuclear device it was carrying. Meanwhile, Yuji's sister-in-law, Keiko (Yuko Takeuchi), is a reporter assigned to cover the story. As Yuji and Shinichiro battle the rough mountain weather, she digs deep to find the missing secret agent who's holding some key information. All of this adds up to a race-against-the-clock potboiler, yet watch how the filmmakers handle the material. Despite the threat of nuclear annihilation, the danger is always small-scale - as a thriller, "Midnight Eagle" is stubbornly intimate. The screenplay focuses entirely on the characters, even pausing to reflect on their personal lives and offer small, warm moments that build the characters as something more than mere pawns for the plot. Several memorable scenes do not involve the story at all, and simply exist to flesh out Keiko's home life, which only makes us care more deeply come the emotionally bruising finale. Even the action is more immediate, more small-scale. Matters involving the fate of an entire nation (and, perhaps, the entire world) are condensed to the point of view of a handful of people, and we experience these matters through their eyes. Again, it's character first, with engaging results. Narushima does not shy away from the melodramatic or the heavy handed; several shots linger on unnecessary over-the-top symbolism. But these ostentatious visual gestures aren't enough undermine the heft of the drama on display, and "Midnight Eagle" plays out as an unexpectedly personal thriller that thrives on complexity and ambiguity. With photography that plays up the stark mood of the film, "Midnight Eagle" reveals a variety of looks in this anamorphic widescreen (2.40:1) transfer. Nighttime scenes and grungy locations are given a pinch of grain, with black levels that threaten to go slightly muddy; happier scenes get a clean, bright look, with crisp detail. The mountain scenes feel a bit muted - the snow's more gray than white - while maintaining a crispness. Everything looks the way it should. The Japanese soundtrack gets the Dolby 5.1 treatment and comes through wonderfully, nicely balancing dialogue, effects, and a notably old school musical score (plenty of synthesizers mixed in with the orchestra). Two optional English subtitle tracks are provided: dialogue-only and SDH. A third subtitle track, accessible through your remote but not the menu, offers English translations of signs and other on-screen text, but no dialogue. "Midnight Eagle" may be too dry to appeal to fans seeking large scale action theatrics, but its focus on character and political quandary will surely appeal to those in the mood for intelligent suspense. Recommended.